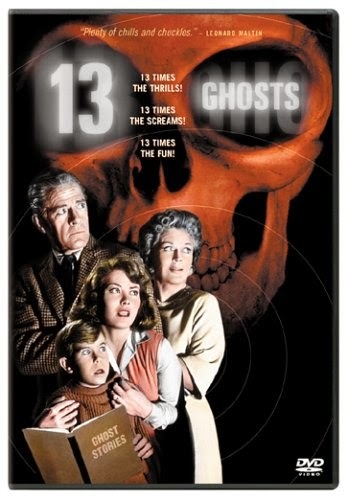 "13 Ghosts" (1960) starring Charles Herbert, Jo Morrow, Martin Milner, Rosemary DeCamp, Donald Woods and Margaret Hamilton is a William Castle horror movie that invites the audience to use their ghost viewers to see the ghosts on screen. The Zorba family, which is in financial dire straights, inherits a haunted house from their reclusive uncle but they must live in it in order to keep it. The house contains the deceased uncle's collection of ghosts which he was able to see with his special ghost goggles and process for capturing them. Soon after moving into the haunted house, the family is playing with a ouija board that they find and they get contacted by their first spirit. At certain times throughout the movie, the audience is instructed to put on the ghost viewers and the screen turns a bluish color while the ghosts show up in a translucent red color. The housekeeper is played by Margaret Hamilton and she tries to help the family discover the secrets of the house and the ghosts within. This is a fun old haunted house movie filled with ghosts, an old mansion and a "Leave it to Beaver" style family that tries to survive the terrors they encounter. Yes it is OK. Thanks!